For as long as there have been televisions, there have been Christmas specials. The variety programs that were ubiquitous in TV’s early years provided a perfect vehicle for stage-trained performers to entertain national audiences with holiday fare. These episodes typically aired during Christmas week, allowing viewers a chance to celebrate the season with their favorite hosts. Fast forward to the 1970s, when beloved emcees like Perry Como returned annually with new holiday specials, after their weekly programs had left the air. The format may have lost favor with the networks, but variety shows still made a comeback every Christmas. It was the one time of the year when it was okay to sing, dance, and maybe even get a little spiritual in primetime. getTV remembers those days, and we honor that tradition with our Most Wonderful Month Of The Year celebration. We’ll present special holiday programming every weekend until Christmas — and we’ll bring some of your favorite holiday specials out of the vaults on Sunday nights! Here’s a complete guide to classic holiday variety shows on getTV in December. Make a list of your favorites — and check it twice! Originally broadcast on December 19, 1973, this episode of The Sonny And Cher Comedy Hour (1973) features William Conrad (who reads “Yes Virginia, There Is a A Santa Claus.”) It’s a bittersweet show for fans, since it would be Sonny Bono and Cher’s final Christmas show as a married couple. Airs December 1 at 2a ET. 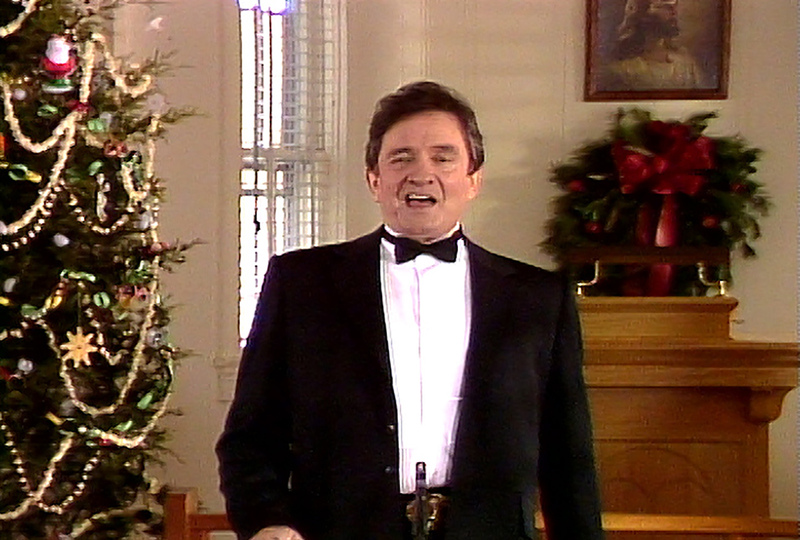 The Man In Black hosts a special holiday episode of his 1969–1971 CBS variety program, originally broadcast on Christmas night in 1970. Johnny welcomes Roy Orbison, the Everly Brothers with their dad Ike Everly, comedian George Gobel, Minnie Pearl, Mother Maybelle Carter and the Carter Family, parents Ray Cash and Carrie Cash, and newborn son John Carter Cash for this heartwarming hour. This is the closest any of us will get to attending a Christmas party at Johnny and June’s house. Airs December 2 at 10p, December 16 at 1p, and December 23 at 10p ET. After Sonny and Cher no longer had each other, babe, they launched competing variety shows. Cher’s show — inventively entitled Cher — was the far bigger hit, surviving for two seasons (while Sonny’s died after just 13 weeks). Originally broadcast on December 21, 1975, this episode features Sanford And Son star Redd Foxx (who sings), comedy trio The Hudson Brothers (who also sing), actual singers The Lennon Sisters, and Sonny and Cher’s daughter Chastity (now known as Chaz Bono). Just two months later, the divorced couple would reconcile for the TV cameras and launch a new Sonny And Cher Show. Airs December 2 at 11p, December 7 at 2a, December 22 at 2a, and December 25 at 1a ET. The Magic Of Christmas features Gladys Knight & The Pips, Barbara Mandrell, and Ronnie Milsap singing traditional hymns, carols, and gospel songs before an enthusiastic congregation at the First Presbyterian Church of Hollywood. And leading it all is the ever-charming Mac Davis, one of country music’s great crossover stars. Airs December 3 at 12a and December 16 at 11p ET. From “the cradle of American democracy” in Williamsburg, Virginia, Perry Como’s Early American Christmas is part variety show, part history lesson. Como welcomes film icon John Wayne (in one of his final appearances), who looks and sounds hearty as he joins Perry for a sing-along of “We Wish You A Merry Christmas.” Actress Diana Canova (Soap) demonstrates a lovely singing voice on three show tunes and Como closes the show with an extended rendition of “Ave Maria” set in a Revolutionary War-era chapel. Airs December 3 at 1a, December 17 at 1am, December 21 at 2a, and December 25 at 3a ET. On this 1977 broadcast, the Man In Black welcomes wife June Carter Cash, gospel quartet The Statler Brothers, and Cash’s label mates from Sun Records: Roy Orbison, Jerry Lee Lewis, and Carl Perkins. Johnny also joins the recently departed Roy Clark for a tribute to Gene Autry, featuring duets of “Here Comes Santa Claus,” “Frosty The Snowman,” and “Rudolph The Red-Nosed Reindeer.” Cash and his family visit the Holy Land and the entire cast closes the show with “Born In Bethlehem.” Airs December 9 at 10p, December 20 at 2a, and December 23 at 11p ET. In this 1996 special recorded at New York City’s historic Shubert Theater, the former Miss America hosts pop superstar Phil Collins, country icon Shania Twain, R&B legend Luther Vandross, The Boys Choir of Harlem, actress Rosie O’Donnell, Kenneth “Babyface” Edmonds, and tap dancer Savion Glover (from the Tony-winning musical Bring In Da Noise, Bring In Da Funk). Williams and The Boys Choir close the show with a funky rendition of “Hark The Herald Angels Sing” that’s sure to leave toes tapping. Airs December 10 at 1a and December 15 at 6a ET. The Godmother of Soul’s first primetime special aired on NBC on Thanksgiving night in 1985 and has been largely unseen since. LaBelle was enjoying a huge career resurgence at the time and she gave this show her all with inventive arrangements and unforgettable duets. Guests include Cyndi Lauper, Amy Grant, and Luther Vandross. Airs December 15 at 2a ET. Johnny Cash hosts this delightful family affair from Maces Spring, Virginia. Wife June Carter Cash takes us to her childhood home and offers a history of The Carter Family, then sings with sisters Anita Carter and Helen Carter and cousins Janette Carter and Joe Carter. Merle Haggard breaks out his fiddle and Ricky Skaggs duets with Cash on “Turn Your Radio On,” “What Would You Give In Exchange,” and “In The Sweet By-And-By.” Next, The Man In Black solos on “I Walk The Line” and sings “Old Time Religion” with brother Tommy Cash and sister Joanne Cash Yates. June is joined by The McLain Family Band for “Back Up And Push,” and Johnny and the Carters close the show singing “Silent Night” and “Where The Soul Never Dies.” Airs December 16 at 10p and December 24 at 12a ET. The religious traditions of Christmas often feature prominently in Como specials, but never more than in this production which was shot on location in Jerusalem, Bethlehem, and Galilee. Richard Chamberlain recites from the Bible and explains the history of the region. Como, a devout Roman Catholic, also pays tribute to the interfaith heritage of the Holy Land by visiting a kibbutz and attending a traditional Hanukkah celebration with Israeli singer Ilanit. And the program concludes with a reenactment of the Nativity story, narrated by Como and filmed in many of the locations where these events happened. Airs December 19 at 2a and December 25 at 2a ET. Eating is a vital component of the holidays, and Perry does plenty of that in this delicious 1982 special, particularly in a French pastry-filled rendition of “The 12 Days of Christmas.” He learns the history of the Can-Can in Montmartre and performs in a traditional Paris music hall with French vocalist Line Renaud, Argentine musician Jairo, and American actress Angie Dickinson. And Angie joins him for a duet of carols as they float up the River Seine. Who knew the Police Woman had such a great voice? Airs December 24 at 1a and December 25 at 5a ET. This Peabody Award-winning 1976 special, filmed entirely on location in Austria, has the look and feel of a movie. Perry shops in the Salzberg Christmas market, sings a medley of beloved songs from The Sound of Music in the Austrian Alps, and does a traditional rendition of “Silent Night” in the Central Bavarian church where Franz Gruber composed the carol in 1818. In between, Perry welcomes actress Senta Berger, comedian Sid Caesar, Olympic skier Karl Schranz, the Vienna Boys Choir, the Salzburg Marionette Theater, and the Vienna Waltz Champions. Airs December 25 at 4a ET. The Most Wonderful Month Of The Year continues on getTV through December 25. For more, visit the getTV schedule.